Conventional automation and power measurement technology are increasingly converging. With the integration of the new Beckhoff EL3783 oversampling terminal for power monitoring into standard control systems, high-precision grid analysis becomes available for power-generating systems. Most importantly, 3-phase AC voltage systems up to 690 V can be analysed simultaneously on six channels and with 20 kSamples/s directly in the PLC. 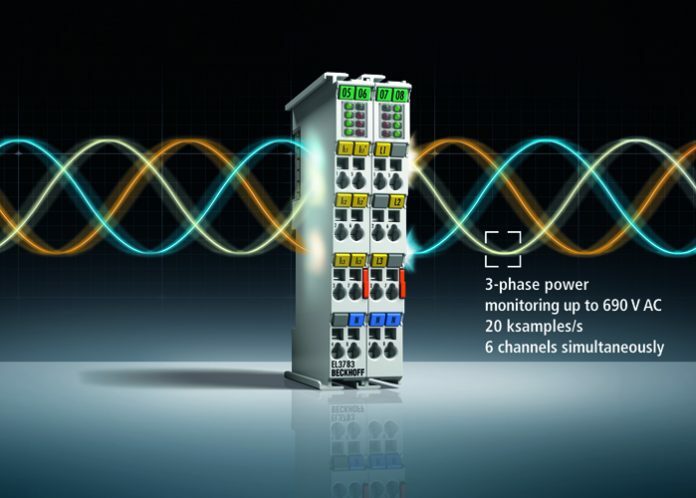 For each of the three phases, the EL3783 EtherCAT Terminal from Beckhoff samples voltages up to 400/690 Vrms and currents up to 1 or 5 Arms as instantaneous values with 16-bit resolution. The six terminal channels are evaluated simultaneously based on the EtherCAT oversampling principle, with a temporal resolution of 50 µs, i.e. significantly faster than the cycle time of the controller. Using the EtherCAT distributed clocks functionality, it is also possible to measure synchronously (<< 1 µs) with other EtherCAT devices in systems of virtually any size and precisely detect propagating grid faults, for example. Extensive data with relevant details are available in the control system if true RMS and performance calculations or complex user-specific algorithms are used to analyse the voltage and current curves, for instance. In addition, the EL3783 EtherCAT Terminal achieves 650 per cent of the nominal 1-ampere measuring range through automatic current range switching, offering high accuracy with a maximum measurement error of only 0.2 per cent (of the full-scale value). In conjunction with TF3650, the TwinCAT 3 Power Monitoring library, the EL3783 Terminal represents a highly dynamic measurement system for detailed network analysis that is seamlessly integrated into standard PC-based control technology. In this way, requirements for network supporting measures in the event of voltage drops (LVRT, Low Voltage Ride Through) can be identified, for example, or harmonics analysis can be used to implement condition monitoring without additional costs for acceleration sensors.